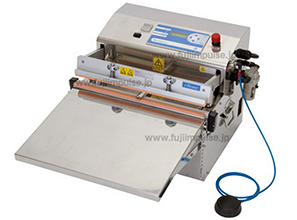 V-460/V-610 Series sealers are compact desktop type vacuum impulse sealers (degassing packaging machine), effective for maintaining freshness of perishable and various food products, and for preventing oxidation and shifting (while in transit) for sensitive parts and products in medical, life science, electronics, precision equipment, chemicals, automotive — across all industries and businesses. Vacuum packaging can control unwanted ambient gases to better assure that your ultimate goal is not compromised. 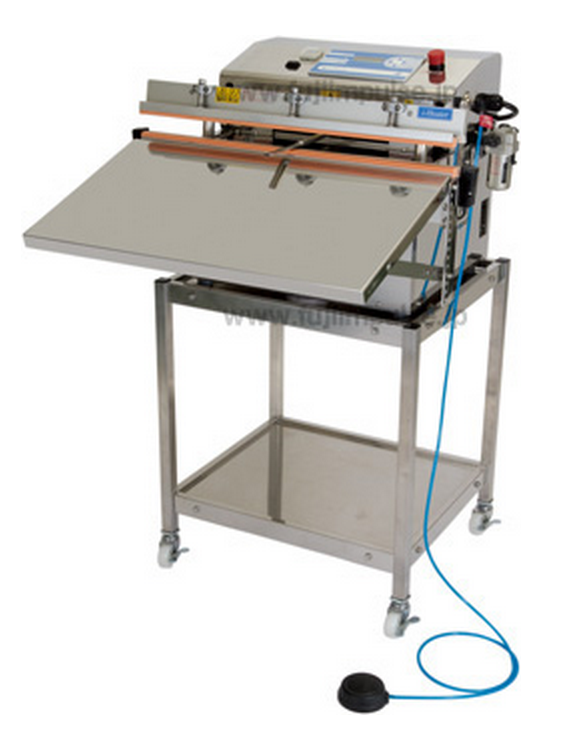 V-460/V-610 Series sealers come with built-in ONPUL heating temperature control system that allows you to set and maintain an ideal heating temperature, and have an easy-to-maintain solenoid-drive system. 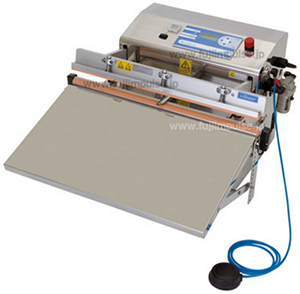 The sealer body is compact, offering reliable and high quality vacuum seals and packaging with a simple and easy operation for your heavy duty challenging task. 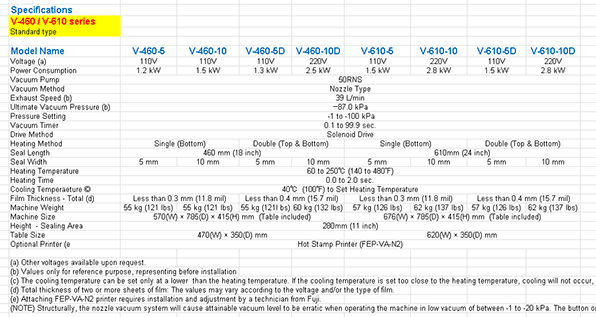 You can choose from three different types of vacuum generators (pump) meeting your specific purpose and environment. 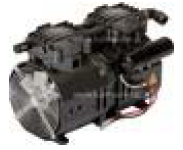 Air Compressor is no longer required, and the system offers easy maintenance. The air-cylinder system applied in conventional models has caused condensation in the compressor, resulting in water droplets that need to be removed from compressed air through a dry filter. The solenoid-driven system eliminates the need of cleaning and replacing the dry filter, which makes everyday maintenance easy. Thanks to the solenoid-driven system, you can save a lot of money. Not only it does not require an air compressor and piping installation to operate the machine, but also there is no need for periodic replacement of dry filter. 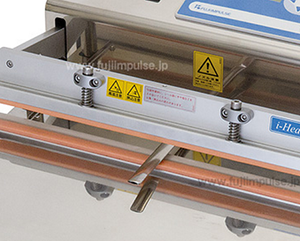 NEW built-in “i-Heater” is made of special material offering minimal thermal expansion. With this material property, heating elements are more durable than ordinary or conventional elements, reducing the risk of heater break in the middle. “i-Heater” also contributes to extending the life of peripheral components and parts such as the temperature sensor in contact with the heating element. Click here to learn more about “i-Heater”. To accommodate vertically long bags, the length of the nozzle can be adjusted in eight-step with 10 mm increments from 10 mm to 80 mm. From the left, pictures show the nozzle completely retracted, extended at 40 mm, and extended at 80 mm. Temperature Control System is included as a standard feature. You can expect the ideal sealing conditions “all the time”. The greatest benefit of ONPUL is the power to offer the ideal sealing condition all the time. 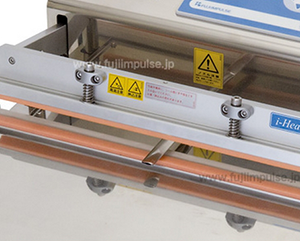 The heating temperature setting is made by a highly sensitive temperature sensor and a micro controller. Regardless of the air temperature or the unit temperature increase (from hours of prolonged use), ONPUL enables you to set and keep the pre-set heating temperature just right for melting film. Accordingly, the ONPUL system is energy efficient, upgrades the sealing accuracy, and reduces the wear and tear on the parts such as the heating element. Click here to learn more about “ONPUL”. 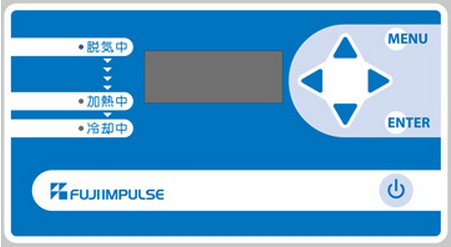 The microcomputer controller is used to select the job style, vacuum mode, and to set sealing condition. The touch panel screen makes the setting easy, and you can confirm the setting in the LCD screen. Four (4) different working options are available from the combination of the job style and vacuum mode. You can select the option to meet your specific needs on your packaged product(s) and required packaging finish style. You can register up to 10 customized working patterns. With a registered pattern in the micro-controller, you can easily replicate the exactly same task in the same condition. With the Maintenance mode, you can see any problematic areas and conditions in a blinking light in the LCD screen. This function helps you identify the trouble easier. The black square in the chart below indicates a blinking light while the white squares indicate a solid light. You can adjust the height and angle of the standard table according to your packaging conditions. Air filter removes moisture, fine powder, and foreign materials suctioned through the nozzle. When power continues to be distributed to the heating element for over 4.5 seconds (abnormal heating), the breaker automatically turns off and the power shuts off. When a temperature increase is detected during the cooling process, the lever goes back to its original position, and an error message is displayed on the control unit. To prevent heating while the lever is open, the system does not start distributing electricity to the heating element unless both the position sensor (at the bottom lever) and microswitch are turned on at the same time. You can press the Emergency Stop button anytime to turn off the breaker and the power. 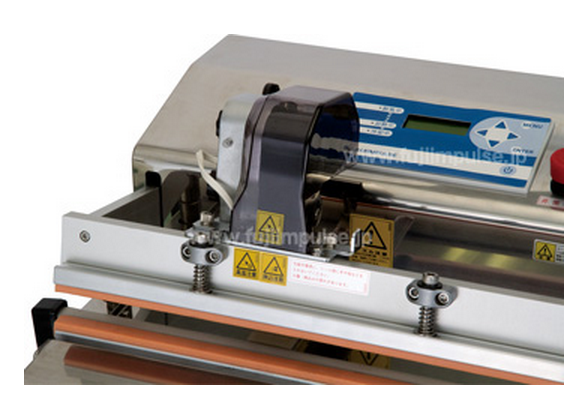 Exterior 2-line printing device (Model Name: FEP-VA-N2) can be installed as a manufacturer option. It is a hot-print-type printer using heated types to print carbon, and prints texts and dates such as Mfg Date or Expiration Date (“Sell by MMDDYY”). The special stand is available to exactly fit the unit size.